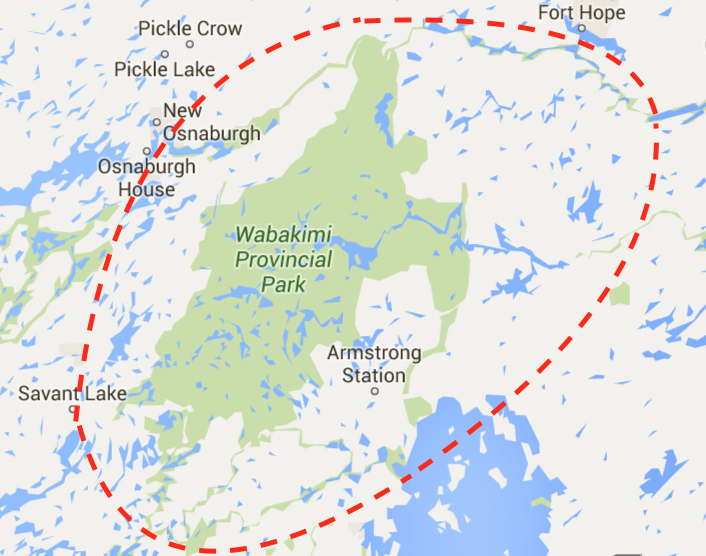 The Wabakimi Area – with Wabakimi Provincial Park’s 8,920 square kilometers (3,440 sq. mi.) as its core – is one of Ontario’s more remote and vast paddling destinations. The network of lakes and rivers scratched by retreating glaciers some ten thousand years ago have made this section of the Canadian Shield a paddler’s paradise. It is bounded by the Albany River to the north, Highway 599 to the west, and the Kopka River and Lake Nipigon to the south and east. Click here to access a Google map and zoom in or out for more detail. That makes the Wabakimi area larger than the state of Connecticut or twice the size of the province of Prince Edward Island. And the amazing thing is that this remote section of north-western Ontario sees very few visitors. While a number of fly-in fishing outposts see some action, it is the seven hundred or so canoe tripping parties each year who mostly have Wabakimi to themselves. The reward for making the 250-kilometer trip up the highway from Thunder Bay to Armstrong Station is a memorable trip on any one of the many possible combinations of waterways through this slice of the Boreal Forest, limited only by time and ambition and perhaps the willingness to splurge on a bush plane insertion or pick-up. Back in early 2010 my bro Max and I hadn’t even considered Wabakimi; actually, we had never even heard of it! And if we had, the distance from our southern Ontario homes would have made us think hard about driving that far. 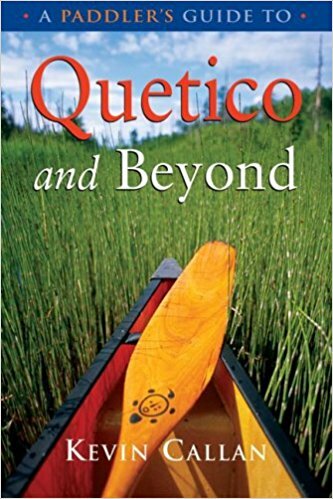 Then we found Kevin Callan’s book A Paddler’s Guide to Quetico and Beyond; it has a chapter which focusses on the Beckwith Cabins on Best Island in Whitewater Lake. It provided us with the initial motivation to make the 1600-kilometer drive. The other day while reminiscing about our four trips – about sixty paddling days in some of what Wabakimi has to offer – we mulled over a list of our half-dozen favourites, those places with a definite “wow” factor. Subjective as any such list will be, we figure that our attempt to nail The Six has to contain at least a highlight or two that would make the cut no matter who was making it! For what it’s worth, here is our Wabakimi Top Six! a small stretch of Cliff Lake’s vertical rock face – that’s Max on the cliff edge! In spite of having visited Wabakimi the two previous summers, we had not even heard of Cliff Lake and had no idea of what we would find. It took a trip report by Chuck Ryan to make us aware of the lake as one of the great pictograph lakes of the Canadian Shield. While the fifty feet plus in height rock faces that line some stretches of the lake are awesome in themselves, the presence of two or three-hundred-year-old Anishinaabe rock paintings elevates the lake to an even higher level. The east-facing orientation of these pictographs provides an interesting counterpoint to those on the west-facing Mazinaw Cliffs found on the other side of Ontario in the much more easily accessible Bon Echo Provincial Park. We will definitely get back to Cliff Lake one summer soon – and this time we’ll spend more than a day there to experience the pictographs with hopefully both a setting and rising sun! For more info on Cliff Lake, see The Pictographs of Wabakimi’s Cliff Lake – Selwyn Dewdney Takes Us On A Tour! The Kopka is one of the favourite rivers of Cliff Jacobson, the U.S. version of Ontario’s #1 canoe advocate, Kevin Callan. References to it pop up in a couple of his books that I have read through. Like Cliff Lake, it wasn’t a destination I was at all familiar with before I started researching. What Max and I ended up with was a twelve-day canoe trip from Allan Water Bridge to the highway back to Armstrong Station. It took us up the Brightsand and Kashishibog Rivers and, for the last five days, down the Kopka River from its headwaters in Redsand Lake. While the entire trip was memorable, the most dramatic is the section of the Kopka from the south end of Lake Kenakskaniss to the bottom of the last dramatic set of rapids. This stretch makes up the Seven Sisters section of the river. In the barely two-kilometer distance between these two points, there are seven drops in elevation, adding up to an awe-inspiring 215 feet (65 meters). We were so taken by this stretch of the river that we are planning another trip that will combine it with a return visit to Cliff Lake – the ultimate double-header and one we can do in ten days or less. It would start with a plane ride from Mattice Lake to Cliff Lake and then a three-day paddle down the Pikitigushi River to the Mud River VIA train stop. A train ride to the west of Collins and we’d access the Kopka via the Aldridge Lake route. The return visit will definitely include more time spent just being there instead of paddling through. Update 2018: Instead of connecting the two by train we ended up paddling down Lake Nipigon and up the mouth of the Wabinosh River to Wabinosh Lake, which is where the Kopka ends its run. You can’t go wrong with waterfalls and sets of powerful rapids on any Top Six list; they demand respect and elicit awe from those paddling by. 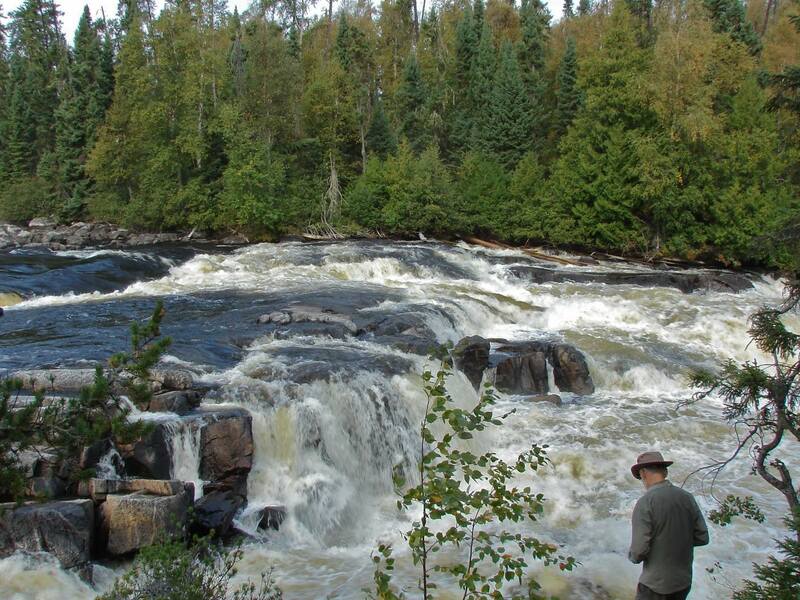 While we missed the challenging rapids just up river from where the Misehkow empties into the Albany, we did get to experience four sets of Albany waterfalls over a two-day period as we paddled down towards Petawanga Lake. Well-trodden portage trails around all of them made for easy carries; we would dump our gear at the end of the trail and then walk back up river with our camera gear, hoping to capture a little of the magic. Upper Eskakwa, Eskakwa, Snake and Miminiska too – what a buzz to stand there and take it all in! The Albany River (892 kilometers from its headwaters in Cat Lake to James Bay) shares “longest river in Ontario” status with the Severn River. And while it is no longer the river it once was, having been neutered by a number of water diversion schemes, it is still an impressive river. We were glad our canoe trip included at least a few days on this historic waterway of the fur trade era. We won’t soon forget the Misehkow, a short and little-travelled river system which flows about one hundred kilometers from its headwaters east and north into the Albany. The only signs of human activity along the length of the river are an abandoned outpost on Rockcliff Lake where we landed and a mining camp just below the river’s one major waterfalls, Iron Falls. What we did see during the three days we spent on the river was a half-dozen moose – more moose than on any stretch of river before. at OM on the Misehkow – Day 4 campsite and meditation center! The Palisade is another short Wabakimi river which empties into Kenoji Lake after winding its way south and east from its headwaters near Burntrock Lake. It has some beautiful narrower stretches that really add a certain intimacy to paddling through Canadian Shield country. We did the scenic stretch from Kenoji up to the turn-off for Scrag Lake. We had actually planned to go all the way up to Burntrock Lake; unfortunately, it was the summer of 2011 and NW Ontario was ablaze with a record-setting number of massive fires. Thunder Bay 50 had its start right near Burntrock Lake so our route plan changed. From Wabakimi Lake the Ogoki River takes you down to Whitewater Lake, passing through Kenoji on the way. Located around the lake are a number of lodges and outposts that make it seem quite busy and yet on our two trips across the massive lake, we saw no one…no fishermen and no paddlers. When we paddled by the Ogoki Lodge we stepped on shore to take a look and were surprised to find an abandoned set of buildings, the most impressive being the main lodge pictured below but also including four cabins and a two-storey motel-like addition. It was an incredible amount of real estate to be sitting there idle and we wondered what the story was. One story we later heard was that the tipi-inspired building at Ogoki Lodge was designed by an eccentric American hermit by the name of Wendell Beckwith who had lived on nearby Best Island until his death in 1980. Since it was just a short paddle to Best Island we went to check out what he called “the center of the universe”, feeling a little like pilgrims as we walked around the site and peeked into the three cabins that he had constructed. As impressed as we were with Beckwith’s work, we left with a more depressing thought. It was clear that if something is not done soon time and nature will combine to bring down the Cabins. The largest of them has a massive hole in the roof which is open to the elements; the blue tarp seen in the image above was someone’s attempt about a decade ago to deal with the problem. It has been five summers since we were there and when our thoughts turn to the fate of the Beckwith Cabins we end up with a meditation on the one certainty that no one or no thing can escape. I know – more waterfalls! The two on the Allanwater River system are especially welcome after spending a day paddling the length of Brennan Lake. Had it been a rainy day – or had the water level been higher or lower – it may well have been all different. On another day we may have kept on going in search of a camp site a bit further down river. Instead, we stopped at two in the aft to enjoy one of those perfect afternoons which became a perfect evening. Looking around we agreed that we were lucky to be smack dab in the middle of one big WOW. And there you have it – our subjective take on the best of Wabakimi! Given how much there is to explore, we’ve clearly not paddled by a spot or two that really should be on this list. If you’ve been to Wabakimi, let us know if we hit some of your high points and what spots we missed. You’ll be giving us ideas on where we should get to on our next Wabakimi canoe trip! WWII POW Camps in the Armstrong Station Area – The Real Story! This entry was posted in Pictographs of the Canadian Shield, wilderness canoe tripping and tagged Albany rapids, Best of Wabakimi paddling, Best Wabakimi canoeing, Misehkow moose, top places in Wabakimi, Wabakimi Cliff Lake, Wabakimi highlights, Wabakimi Kopka River. Bookmark the permalink. Wow Wabakimi looks amazing. I’ve never been that far north in Ontario, well not past Thunderbay or Timmins that is. Planning a trip up with the girlfriend to Sleeping Giant PP, Neys PP, Pukaskwa NP and Lake Superior PP. Any tips for a first timer to Norther Ontario parks? Boris, until a few years ago my canoe partner – and brother – and I hadn’t really ventured west of Wawa and the Soo. What we found when we did was an epic country with incredible rivers to paddle. The drive to Thunder Bay is a long one but you get to experience – especially in the section from Marathon to Nipigon – one of the most dramatic stretches of highway in Canada. Last summer we paddled the Steel River, which is located in the country just northwest of Marathon. A ride up there would be a great introduction to a part of Canada that is sure to draw you back time and again. The parks themselves are in great locations and should provide your camera with a good workout! That’s what I’m hoping. Sadly I’m a very novice canoe-er and this trip is with the girlfriend. so sadly long canoe sections are limiting. But I’m looking at some rental places so I can hit lake superior on different sections. Hiking – either day hikes or a multi-day at Pukaskwa – might be the way to go. Less complicated than the canoeing option – no need for rentals – and there are some beautiful boreal forest trails to walk. This website should give you lots of ideas! Definitely check out the pictographs at Agawa Rock in Lake Superior N.P. And make sure to stand underneath the giant goose at the entrance of Wawa. Just found your site (love it), while researching my summer canoe trip this year – to Wabakimi. Do you have any recommended resources, maps, reading, etc? Feel free to email me if you have some specific questions in mind; my bro and I may have the answer! Wabakimi is an undiscovered paddlers’ paradise that will have you hooked after your first visit. I’m planning a Wabakimi trip again this summer and plan to return on the VIA train from Collins to Toronto. This time I’ll try Whitewater Lake and the centre of the universe. Dan, the two times we went by train the canoe went on in London, taken off at Union and brought to the luggage room, and then loaded again that evening. Because it was two trains it was double the cost! These days that would be $100. X 2! Are you carrying the canoe and gear to a waiting vehicle? You can walk the canoe from the luggage room at the bottom of the ramp at Union Station to Front Street itself. You may need two people, one to deal with the doors! I guess you would want to walk it to wherever your car is parked nearby. It might be best to go down yourself and take a look at the layout and the parking situation given all the construction and changes down there! The train arrives around 9 a.m. (if it is actually on time!) so you get to hit the end of rush hour! Should be some nice photos of a what looks like a homeless person walking around with a canoe on his head! Good luck getting the CN Tower in the shot! Hi – Which airline did you use from Mattice Lake to Cliff Lake? Thanks! Paul, Cliff Lake is definitely worth a couple days’ visit. On our visit we paddled into the lake from the north. If you want to fly in, Mattice Lake Outfitters is the plane service we have used for other drop-ins. You could paddle back to a take-out spot on the logging road on the Pikitigushi River below Pikitigushi Lake. You could save some money by paddling up to the lake from that logging road put-in on the Pikitigushi River. Mattice Lake Outiftters does shuttles or you could drive your own car and leave it at the Boucher Bear Camp there. It would take a day or a day and a half to get to Cliff lake but would be cheaper! Enjoy your time on the lake – awesome vertical rock face, a couple of great campsites and, of course, the pictographs!